Home. While I enjoyed my whirlwind trip to Florida where I soaked up some much-needed sun and visited with friends, it was nice to return home to the promise of an early spring. This week the forecast is for temperatures in the 60s and 70s, so I’m looking forward to the emergence of our daffodils and crocuses and for the reappearance of our summer songbirds. 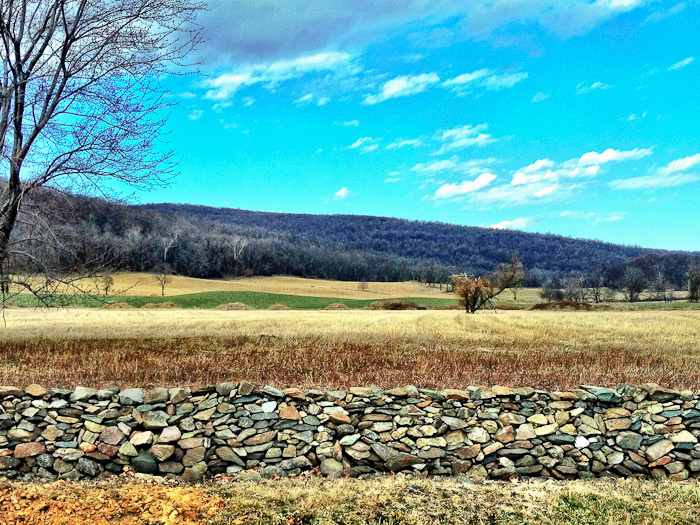 Today’s commute included a stop on Route 50 near the Blackthorne Inn, where a beautiful stone wall lines the side of the road. I think the construction workers find me entertaining, as each time I pull up to wait for my turn on this one-lane section of road I take out my iPhone and start photographing the scenery around me. I’m probably quite unlike most of the drivers who have to stop for these inconvenient roadblocks—I actually look forward to them! Looks like India n landscape! Wow, India must be so beautiful! This is one of my favorite areas in Virginia, the Piedmont and foothills of the Blue Ridge. Atta girl…making the most of a photo op!!! That’s an amazing stone wall with a beautiful countryside background! I swear, I’ll never look at road construction the same again! Ha ha! It’s really just a great photo op!